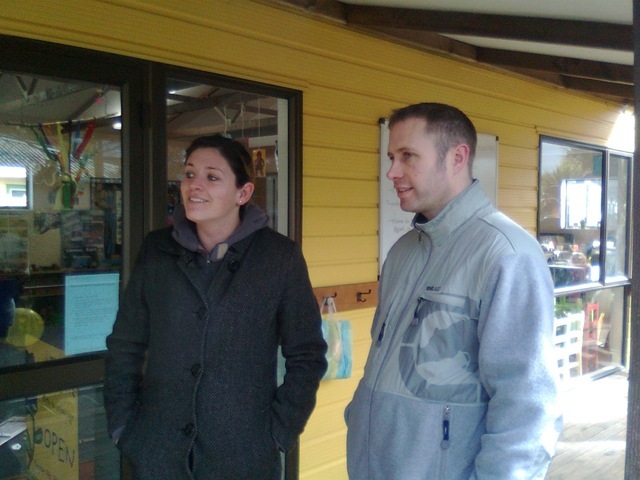 It was a buzz to catch up with the folk of the Linwood Playcentre recently. They had an open day to attract interested folk and raise funds. Playcentres are a great example of local neighbourhoods getting together to provide a benefit for their community. Children learn and play in a family-centred environment. Parents have the opportunity to learn professional skills and contribute to high quality early childhood education. In this photo my city council running mate Councillor Yani Johanson is speaking with Jade, the manager of the Linwood Playcentre. The event hit the local news because it featured hundreds of paper cranes made by the kids to raise funds for a garden in memory of Nayan Woods. Nayan was the four year old killed by a runaway car on Linwood Ave a few weeks back. Like just about everyone else in this town I was deeply touched by the tragedy, which occurred on a route I travel most days. So the Linwood Playcentre had a big day as dozens of folk flocked there, largely out of respect for Nayan and his family. It was lovely to have the opportunity to meet Nayan’s big brother Jacob and speak with his Mum and Dad, Emma and Duncan. I had been very impressed by their public display of forgiveness and understanding after the accident. They were kind enough to accept my stumbling condolences and chat about the value they placed on their family being involved in the playcentre. I went away inspired. Yani and I were rapt to see the Linwood Playcentre raised $1,000 for its facilities during the open day.